Later this morning a Blue Plaque will be unveiled on the north side of Gordon Square, London to mark the venue of a landmark lecture presented through the Heritage Studies Research Group. 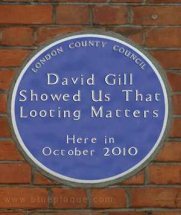 Blue Plaques are a feature of London's cityscape and they are placed to note important historical and cultural locations in the capital. Looting Matters is honoured to have been selected for this treatment. Let's hope it doesn't end up being offered for sale by a dealer and marked "Supplied from a trusted source and not known to be stolen". Hat off to you David. Thank you for these kind comments - they are much appreciated. happy april fools david,that was a good one.i hope the others didnt realy fall for your prank. hi david,i see the greek ostraka [lot 215 christies] have been withdrawn although they are still on the e catalog.do you know anything about this?i know that you have studied /wrote about ostraka in the past as i have read a few pieces by you.were they in polaroids?